There is also a non-gatefold orange vinyl Dutch version as well, which does not have the photo of Rod Stewart or track listing (except on the record itself). I have two identical copies of this but on the B side on one LP the run out is 0.6 c.m and on the other it is 1.6 cm. Labels and LP's are both exactly the same size and the music is exactly the same on both copies. Any ideas? 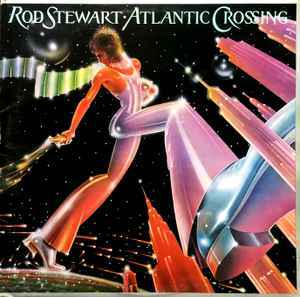 I have to disagree with a sizeable portion of 'Roddites' out there - this is by FAR Mr. Stewart's best album. I've always had problems with the albums prior to this, most of them being highly over-rated, one-dimensional Brit-bar-room-booze-blues affairs. Atlantic Crossing, on the other hand, has it all, from the straight 'rock-out' of 'All In The Name..." & "Stone Cold" to the cod-funk of "Alright for an Hour" through to the killer ballads "I Don't Want To..." & "Still Love You". Rod has always had an ear for a fine tune & the songs he covers here are all exceptional, for the most part eclipsing the originals. I particularly LOVE "This Old Heart" - those familiar with the Isleys' Motown original will be surprised at this slowed-to-a-roll version, resplendent in strings & Country overtones. Simply beautiful. Further examination of "This Old Heart" will reveal why A.C. should be considered a GREAT album. Apart from the strength of songs on the album, the arrangements & musicianship are exemplary, truly outstanding. Any of you who fancy being record producers should listen to each track carefully - every instrument is subtly used, yet essential & totally complimentary. Mandolins, hammond, pedal-steel, fiddle - ooh, la, la. At the start of this review I popped it on just to blow away the cobwebs. Y'know, I was planning on giving this a 4.5, but it's actually a '5'. It's timeless. Highly recommended. Nice one, Rod. TRIVIA: My brother went to school with Rachel Hunter, Rod's ex! She was truly beautiful then...and STILL is! The original UK Burbank label (CBS pressings) also had a second limited edition run pressed on orange vinyl. I have this but the vinyl is blue? Not quite up to the standard of Rod's first 4 LPs ('Every Picture Tells a Story' remains his very best), but his first album on the Warner Brothers label is still an excellent effort, and a big improvement on the previous year's 'Smiler'. The slow half is better overall, contains the hits 'I don't want to talk about it' and 'Sailing'. Recommended.